Wellcraft attacks the bay boat market in 2016, with the 241 Fisherman. 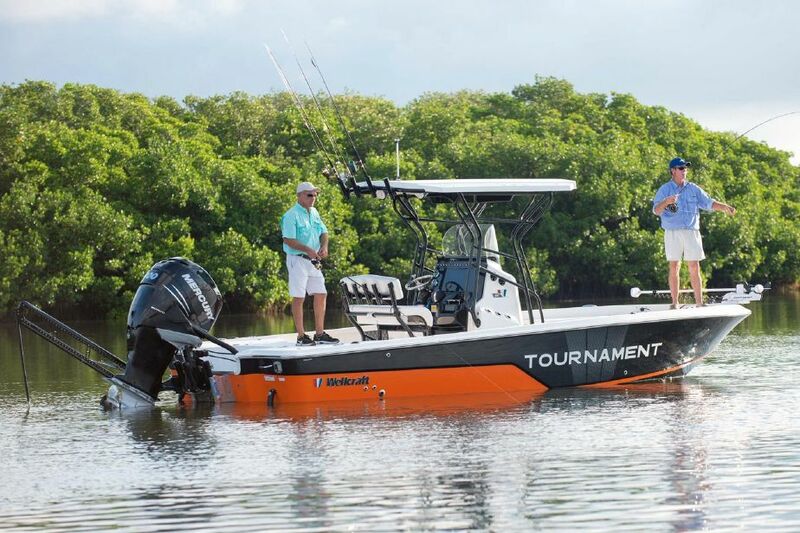 Bay Boats are highly specialized fishing machines and there are entire companies built around this genre alone, so imagine our surprise when we got our first glimpse of the Wellcraft 241 Fisherman at the Fort Lauderdale Boat Show. This builder’s name is epic, for sure, but in the world of dedicated bay boats it hasn’t been a real force—until now. Take a peek for yourself, and we’re pretty sure you’ll share our initial reaction: wow. 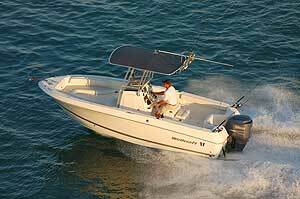 In the Tournament trim, the Wellcraft 241 Fisherman has more than enough razzle-dazzle to draw the eye. Wow-factor, of course, doesn’t necessarily make for a great fishing boat. So ignoring the wild colors and radical T-top pipework, we settled in for a closer examination. And we liked what we found. It seems that Wellcraft did their fishing homework (tough assignment) before laying out the 241 Fisherman. The stern incorporates a bench seat, but it folds down flush to create an unencumbered casting deck. The integrated fishbox drains overboard. Tackle boxes are built-in. And the 34 gallon livewell has a light, timer, and baby-blue interior (which helps keep baitfish calm, and prevents them from beating themselves up against the fiberglass). The console design is another feature worth pointing out. Sure, it encloses a head compartment. You expected that on a 24’4” center console. But check out the rodholders; three are flush-mounted on either side, in integrated bump-outs. Their height is staggered so your reels won’t smack into each other, and small ports are built into the hard top for the rod tips to go through. It’s a well thought-out, effective design. Same goes for the forward console seat, which unlike most is actually comfortable, and swings up on gas-assist struts to allow access to the head compartment without too much crouching and bending. The bowdeck on the 241 Fisherman is well designed and executed. Now keep moving forward and check out the bow casting deck. This is an area where many builders simply put on a few hatches to create bulk stowage areas, and call it a day. But Wellcraft really went the extra mile up here. The hatches are finished inside and out, are gasketed and guttered, and swing up on gas-assist struts. Beneath them you’ll find stowage, yes, but there’s also a dedicated compartment for a five-gallon bucket, and a (optional, 14 gallon) second livewell. Down-sides? Wellcraft made a tough call on gunwale design, opting to minimize width to provide maximum interior volume. Many anglers will like this tact, but some prefer wide gunwales which allow you to walk from bowdeck to sterndeck, and fish from an elevated position 360-degrees around the boat. A side-effect to the narrow gunwales is that it’s easier to accidentally kick rigs stowed in the under-gunwale rodracks, though truth be told, these are better utilized for brushes and mops than fishing rods on the vast majority of the center consoles out there. Still, Wellcraft did take the extra step of padding the inwale where reels would otherwise smack fiberglass. 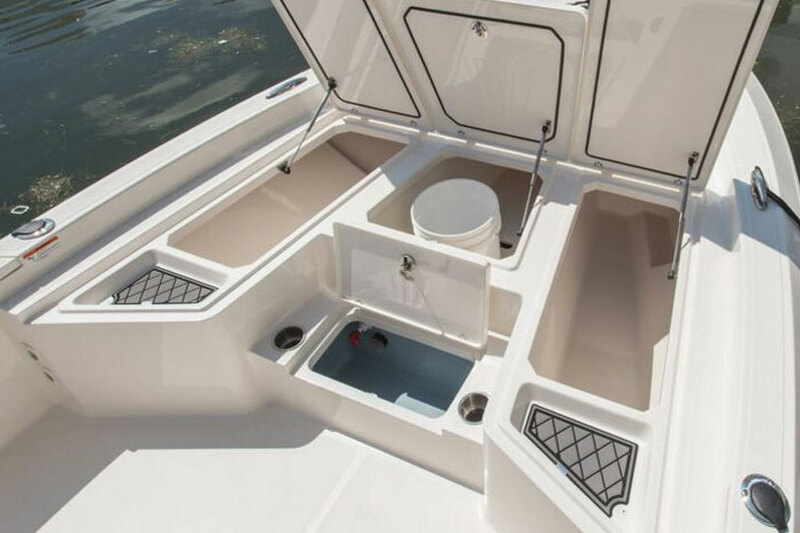 One other beef: I’m not in love with the plastic access hatch in the aft deck, which just seems out of place on such an otherwise finely detailed, high-end boat. 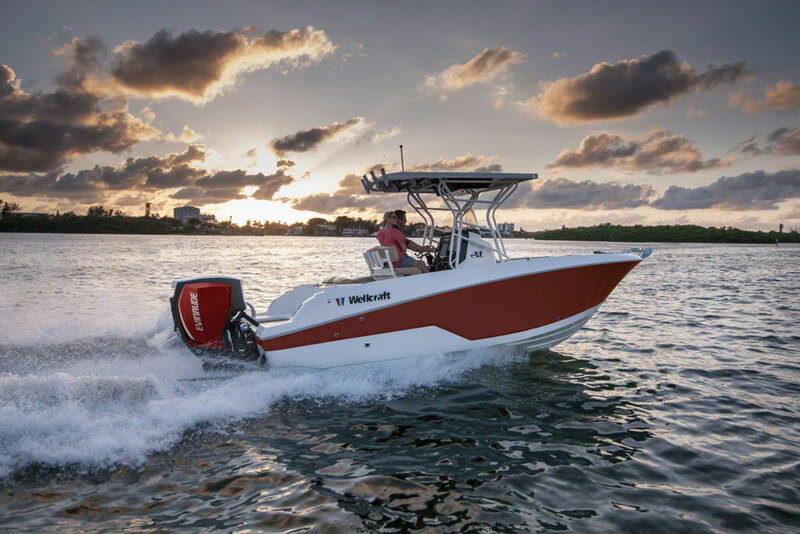 So far as performance goes, while we obviously couldn’t run the 241 in the convention center and no reports we’re willing to quote exits as of yet, Yamaha has issued a performance bulletin on this boat’s smaller sibling, the 221 Fisherman, with a F200 outboard. And in our experience, Yamaha’s performance bulletins are mirror images of what we record ourselves during boat tests. So we can make a few inferences. The 221 cruised in the low 30’s and topped out at 43.4 MPH. Considering that the 241 weighs just 300 pounds more than the 221 and can take 300 horses on the transom (your choice of E-TEC, Mercury, or Yamaha), smart money says a 241 with max power is going to get you past the 50 MPH mark and then some. And since the 241 has a whopping 35 gallons more fuel capacity than the 221, you can safely bet that there won’t be any real loss of range (in the neighborhood of 200 miles, at best cruise). As for exact numbers, we’ll post an update as soon as we can get a test run. Until then, remember: wow. 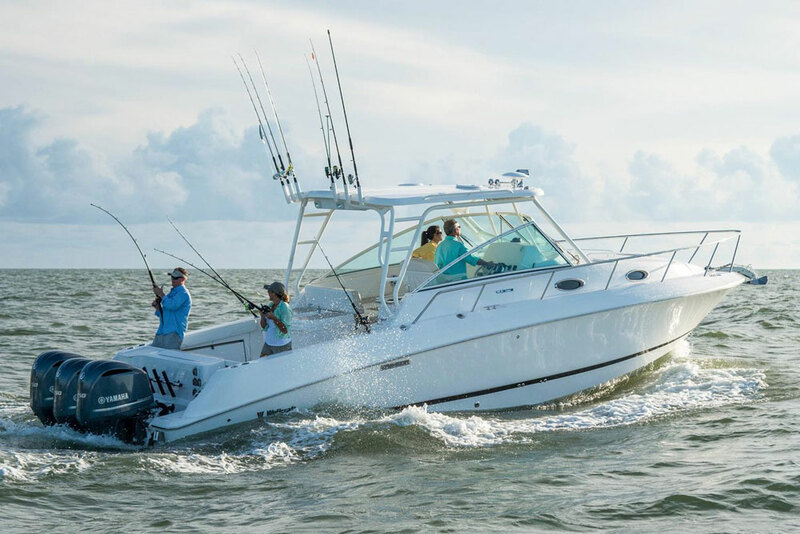 Other Choices: Shoppers considering the Wellcraft 241 may also be interested in the Sea Hunt BX 24 BR, which has a similar displacement and shares the 15-degree transom deadrise. Slightly larger, heavier, and more expensive is the Grady-White 251 CE, which is a bit more tilted towards family boating and a bit less towards hard-core angling. 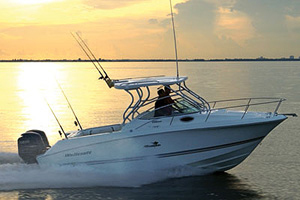 See Wellcraft 241 Fisherman listings. Or, visit Wellcraft for more information. 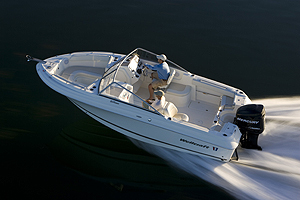 Something a bit smaller and a bit less expensive might be the better boat for your needs? 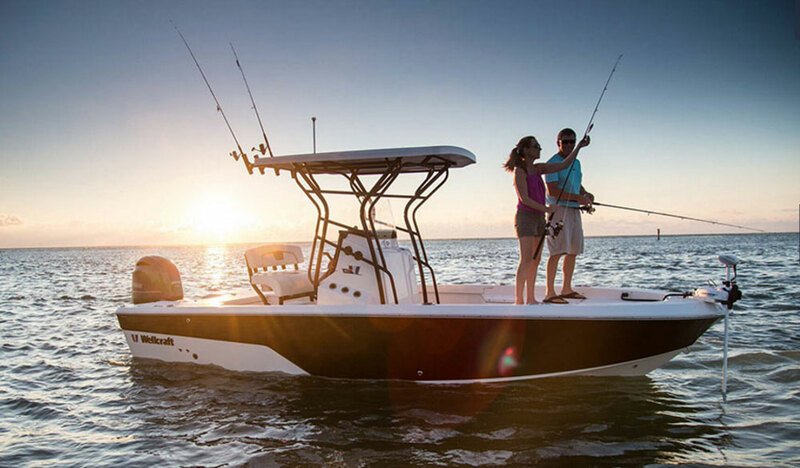 Take a look at the Wellcraft 221 Fisherman. 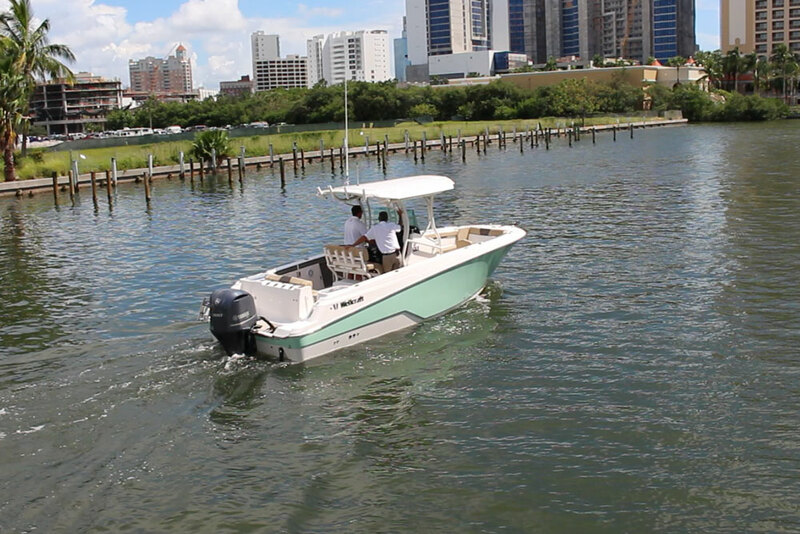 We shot this First Look Video in Fort Lauderdale, so you can get a better look at the boat first-hand. 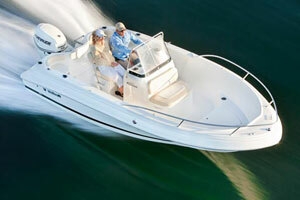 See Wellcraft 221 Fisherman listings.